The journey of audience engagement and subscriptions is becoming increasingly interesting, as media publishers focus on a specific issue or underlying business objective. There’s no one way to go about it. We’ve decided to curate the past few weeks worth of online coverage on ‘experimentation’ taking place to keep you posted and have you rethink of new experiments or ongoing tweaks you can take with your audience engagement efforts. Nieman Journalism Lab is conducting a lot of little experiments in order to change FT’s brand perception of being an aging white businessman’s publication to being gender inclusive. Renee Kaplan mentions creating a newsletter aimed at women (but not explicitly for), a revamp of their opinion section designed to encourage women to submit editorials, publication wide promotion of over-indexed women’s articles and a new coverage section on professional services have resulted in these efforts to become permanent fixtures. FT Communications declined to share growth targets at this time. Experiment failures can sometimes provide sharper learning opportunities that new media startups particularly avoid when starting out. Whilst OpenFile suspended their publication in 2012, The Membership Puzzle project recently wrote a solid case study about them. The Canadian media startups concept was asking readers to tell you what they think is important and make editorial decisions around that. What they didn’t figure out is how to fund their local journalism so that journalists can spend more time reaching larger underserved segments to the community. Being able to widgetize their stories so that it was easier to sell to partner media companies and having a lead community editor that the readers developed a relationship with were some ‘what-ifs’ mentioned in this piece. Ryan Nakashima, the technology writer of Associated Press news (AP), commences a novel ad-free experiment to help the publishers to identify the conversion opportunities for paid subscriptions. 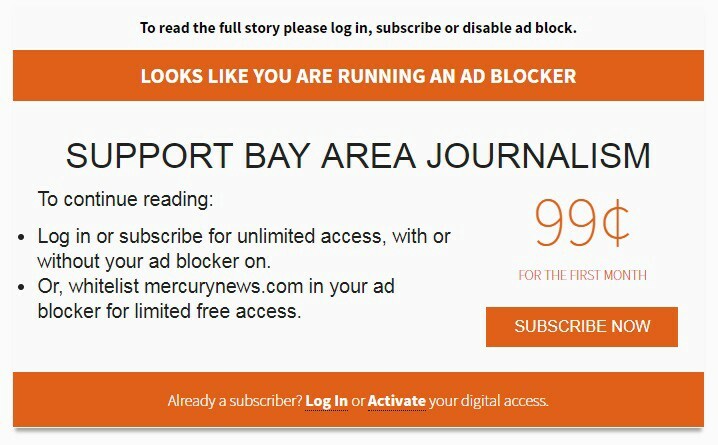 From February 1st, when an ad block user enters the site, it shows the following message: please disable your ad blocker on the site, or subscribe (image below). Ryan believes he’s proved the fact that people value ad-free experiences (just how people pay for Netflix), but is still in the process of determining at what cost, given advertising still drives more revenue per page view. The Guardian US team formed a Mobile Innovation Lab which in 2 years has conducted two dozen experiments, using a $2.6 million grant from The Knight Foundation on improving mobile content publishing. On March 26th, a closing day discussion event was held which shared these learnings to a broad representation of newsrooms. Related: Audience Building: How will digital publishers fare in 2017? For publishers looking at how to harness mobile publishing to an advanced degree, visit The Guardian Mobile Innovation Lab’s Medium Page. Vertical publishing isn’t anything new. Many publishers to date have expanded vertically by creating new topic sections, country websites, or sub-brands within a parent brand. More established companies take the path of merger and acquisitions to expand their portfolio. Buzzfeed’s new Chief Content Officer recently reported the separation of Buzzfeed News & Media from the parent company and talked about its ambitions of creating new brand entities. This announcement demonstrates the need to improve the operational efficiencies to cater to underserved audiences. And creating separate entities can be one way of going about it. With branded content, brands collaborate with media publishers in order to get its message across. What if it’s the reverse situation taking place? The NY Times wanted to explore human subcultures and deliver it in exceptional content formats. Véa, a trendy cracker, decided to back the project and benefited simply by being associated with the brand. None of their brandings was on these story pieces. It’s an experiment in the funding of quality journalism that could have major implications for the future of news, as publishers look to partnerships with brands to extend the operations of their newsrooms without ceding an editorial control. There’s still a question of whether publishers Klout is something that can be adopted for publishers in varying industries. Along with The Robert Bosch Foundation, the News Integrity Initiative, and Zeit Online, the Agora Journalism Center launched a funding initiative called Finding Common Ground, where 7 projects were awarded $10,000 USD each to bridge the trust between media and community for covering polarized topics in an engaging manner. Community in Unity (U.S.) — aims to get people who normally wouldn’t interact into the same room, sit them in a circle, and let them talk. Each conversation starts by asking participants to actively listen to each other with respect, to seek understanding, and to accept that the conversation may bring up issues that won’t be resolved — for example, around incarceration and reintegration of former prisoners. This project creates opportunities for Alaskans to gain a better understanding of life in prison and for inmates to learn how they can fit back into the community. Project lead: Anne Hillman (@hillman_anne). Community Storytellers (U.S.) — hopes to contribute to the overall health and inclusivity of the Ohio County, Kentucky storytelling network by strengthening links between local media and community stakeholders. It takes an assets-based approach — reimagining existing community traditions and utilizing public spaces — to host supper and storytelling clubs and to mentor community columnists. Project leads: Andrea Wenzel (@andreawenzel) and Sam Ford (@sam_ford). My New Homeland — Your New Homeland (Germany) — brings senior citizens with experiences of displacement during WW2 together with recent migrants who have relocated to Germany (North Rhine Westphalia), in towns troubled by prejudice and polarization, to talk about “finding a home (Heimatfindung). How is it possible to begin a new life in a foreign land? The project aims to reduce social distances through moderated public conversations and create integration through direct personal encounters. Project lead: Ina Daniel. No Refuge Tour (U.K.) — will take audiences across the UK behind the scenes of the Bureau Local’s domestic violence work, with the help of a one-woman comedy show created by one of our collaborators during the course of the investigation. The Refuge Woman will be shown to small local theatres, with plans to visit eight locations across England: Leeds, Carlisle, Lancaster, Norwich, Bristol, Birmingham, Sunderland, and London. Project lead: Maeve McClenaghan (@MaeveMCC). NYLA Live (Lithuania) — a series of live debates that aims to understand cultural and social forces that shape our world. The purpose of these events is to focus on community issues and invite the public from different social backgrounds and political views to discuss their ideas face to face, instead of going to angry Facebook comments. NYLA Live debates are recorded and published as special episodes of NYLA podcast and spread to those people who aren’t able to attend the events. Project lead: Karolis Vysniauskas (@karolisvy). South Side Photo Walk (U.S.) — The Stand newspaper is published by the South Side Newspaper Project, a nonprofit based in Central New York. The community paper and website targets Syracuse’s South Side neighborhood and is produced in partnership with Newhouse students, city residents and a community board of directors. The Stand’s annual Photo Walk — going into its ninth year — is the project’s most popular community event. Each July, a photo lesson taught by professional photographers is followed by a walk through the neighborhood to document a typical Saturday. The event brings together people at all skill levels, all ages and from both the neighborhood and surrounding areas. Project leads: Greg Munno (@gregmunno) and Ashley Kang (@Ashley_E_Kang). Since Ryan Nathanson took over the COO position last year, Salon Media has taken greater lengths in experimenting to diversify their revenue streams. In AdExchanger’s interview with Ryan, he speaks about the release of an OTT app to grow their video audience, an ad blocker that gives access to content in exchange for Salon cryptocurrency, micropayments with LaterPay, private marketplaces with brands in creating new branded category content, and industry closed beta programs focusing on tackling ad inventory spoofing and ad delivery using block-chain based technology. Tim Regan-Porter, Lisa Rossi, André Natta, and JulieAnn McKellogg are John S. Knight Journalism fellows who recently designed a local news coffee shop takeover at The Clock Factory in Berkeley, California to figure out how local news content engagement can improve. From initial interview insights, they understood that whilst journalists believed they were creating something of value, their intention to connect deeper to their audiences was lacking intention and focus. Similar to André’s experience as a hotel concierge, they believed customer service as being the missing link in improving the process, which resulted in this customer-service based journalism experiment. As conversations about local issues were taking place in the coffee shop, André would circulate the room and engage in the conversations, similar to a concierge. After the experience, they encouraged people to read the local news five minutes per day for two weeks. There were many lessons learned around making the connection between discussing local issues and reading the local news and direction towards how users needed to conduct conversations. 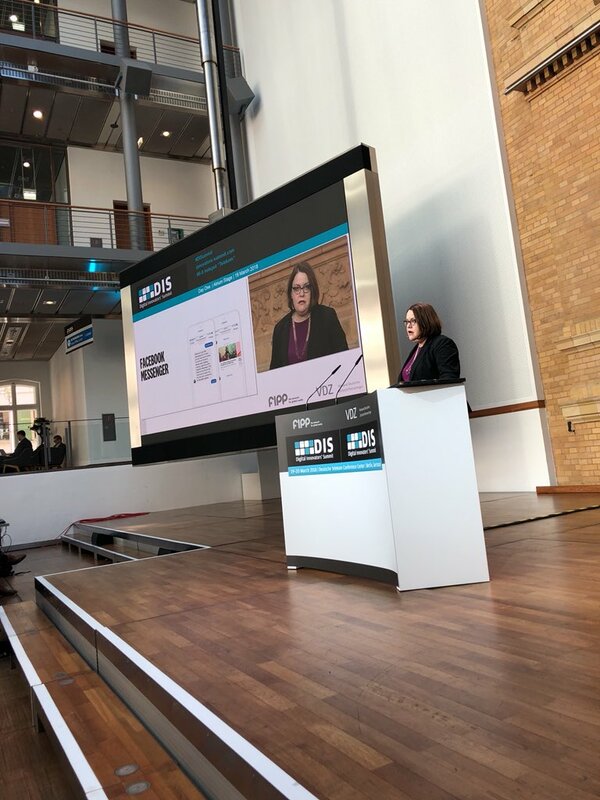 Maureen Hoch, an editor of HBR, explains how the publisher has been using emerging formats to get closer to audiences at the Digital Innovators’ Summit in Berlin on March 19. In its Facebook Live ‘Whiteboard Sessions’, HBR put a reporter or expert in front of a whiteboard to talk through various topics, ranging from how to think like an entrepreneur to the three myths of collaboration. After getting comfortable with the process and finding the right formula, they are now getting 55,000 + views in a time span of a few weeks. One year ago, the publisher published a piece on inequality among both their companies and their employees, and the editors wanted to try using Slack to get readers to connect with the author. The experiment didn’t work as no one was willing to engage on the platform. In September 2017, they launched a Facebook Messenger & Slack bot to deliver the most recent digital articles to audiences. None of the functionality helped with delving deeper into a topic. Most of their users were existing subscribers. It’s still early days. Finally, in the past two months, HBR launched two podcasts in a bid to expand their audio presence – Women at Work aimed to a female listenership, and Dear HBR, an advice podcast for all readers to send in questions. And they will be experimenting with visual storytelling as part of its content curation and community building efforts. These acquisitions will allow them to continue growing from their claimed 7 million unique visitors to further saturate the Taiwanese media market, as they gradually expand into other Chinese speaking Asian countries and the U.S. since it is a costly and lengthy process.